“No room at the inn” means someone wants Nancy to check out—permanently. There’s nothing like riding a horse across the beautiful English countryside, and Nancy has been looking forward to this vacation. But the danger begins even before she arrives at stately Moorsea Manor. Someone steals a road sign, sending Nancy down a dark, twisting road to nowhere. When she finally finds the inn, she’s almost killed by a bronze statue dropped from a second-story window. The owners tell her that there have been other “pranks” as well. And once someone gets hurt, the Moorsea Manor will be out of business. Now it’s up to Nancy to find the culprit—before the guest list becomes a casualty list. George Fayne woke up with a start as her friend Nancy Drew slowed the car. "Are we there yet?" George asked hopefully. "I mean, it's been hours since we left Heathrow Airport." Eighteen-year-old Nancy rounded a curve in the narrow road, then shot George a quick grin. "How would you know how long it's been? You've been sleeping the whole time." George yawned, then peered impatiently out the window at the steep green hills rushing by. "Give me a break, Drew. After that marathon flight from Chicago to London, I'm allowed some shut-eye." She paused, then added, "Anyway, it seems like this whole trip has taken forever. I can't wait to see Moorsea Manor." Nancy smiled. "I'm eager to get there, too. From Aunt Eloise's description, the place sounds awesome -- a luxury inn on a four-hundred-acre sheep farm with tennis courts and four-star cooking. The Petersons grow all their own vegetables and herbs. And the picture in Aunt Eloise's brochure shows a cool-looking gray-stone manor house on a bluff above the sea." "I guess that's why the place is called Moorsea," George broke in. "Because it's between the sea and the moors." "Uh-huh," Nancy said. "It's between the English Channel and Dartmoor, the largest national park in Devonshire. Dartmoor is supposed to have some great places to hike, and even though Moorsea isn't actually in Dartmoor, you can ride or hike to nearby moors. Dartmoor has kind of a creepy reputation. There are a ton of ghost stories about it. Lots of mysterious things seem to happen there." George frowned skeptically. "I guess that Sherlock Holmes story, The Hound of the Baskervilles, did take place there, didn't it?" She shrugged, then continued, "Anyway, everyone was super impressed when I told them where we're staying. The man I sat next to on the plane told me there's a real buzz going on about Moorsea in London. He said it's the cool place to weekend." Nancy nodded, remembering the conversation. "Moorsea Manor is incredibly popular. Aunt Eloise made her reservation to stay there months ahead of time." "I feel bad for your aunt Eloise," George went on, sitting up straight. "She must have been so disappointed when she sprained her ankle and had to cancel at the last minute." "You're not kidding," Nancy agreed. "But she was glad we could take her place on short notice. And I'm glad, too. I'm really up for a vacation." "Ditto," George said, with a toss of her short dark hair. Then she flashed Nancy a knowing smile. "Let's hope it really is a vacation, if you know what I mean, Nan." Nancy laughed. "I think I can guess," she said slyly. Though she was still a teenager, Nancy was already an accomplished detective. George and Bess Marvin, Nancy's other best friend and George's cousin, often helped Nancy solve mysteries that had stumped much older detectives. "It's just that wherever you go, Nan, a mystery usually follows," George added with a grin. Nancy's blue eyes sparkled. "I promise you, George, that I'll do my best this time to have a mystery-free vacation." Rolling her eyes, George said, "Yeah, right. It's too bad Bess couldn't join us. She might have helped me keep you in line." At that moment Nancy caught sight of a wide expanse of blue glittering in the distance. Tiny white patches constantly appeared, then disappeared, on the the smooth surface. "Look, George," she said, "there's the sea -- with whitecaps even. We might be able to take a boat out once we get to Moorsea. I'll bet there's a good wind today." "Super!" George exclaimed happily. "Do you think they'll have other sports besides tennis and boating?" Nancy grinned. Typical George, she thought -- always thinking about sports. "Let me see," she answered. "Well, there's riding, hiking, croquet, biking -- you name it. When Annabel and Hugh Peterson turned their manor house into an inn, they went all out. That's why it's got such an awesome reputation." "What else did your aunt Eloise tell you about Moorsea?" George asked curiously. "Didn't you say she had a friend in common with the Petersons who gave her the lowdown on it?" "That's right," Nancy said, gripping the steering wheel tightly as she negotiated another hairpin curve. "According to Aunt Eloise's friend, Annabel inherited Moorsea from her parents, Colonel and Mrs. Trevellyan, five years ago when they died. It has been in Colonel Trevellyan's family since the seventeen hundreds." "Wow. And to think the Fayne estate has been in the family since the nineteen hundreds," George quipped. Nancy smiled. "Some places in England have been owned by the same family for even longer than Moorsea has." She pushed a lock of her shoulder-length reddish blond hair behind an ear and stole a quick look at George. "But Annabel almost lost Moorsea," she continued. "After her parents died, she had to settle all the debts and inheritance taxes. She was really strapped for cash and couldn't pay the taxes on the place." George let out a low whistle. "I'll bet the real estate taxes on four hundred acres are astronomical." "I'm sure they're enormous," Nancy replied. She glanced out the window at endless green hills dotted with rocks and high granite outcroppings. Every now and then patches of forest, dark and forbidding even in the bright afternoon sun, would flash by, nestled in valleys or alongside hills. Nancy shivered, remembering the tales she had heard about nearby Dartmoor -- its ghosts -- and also about the dangerous thieves and smugglers who had roamed the Devonshire coast years ago. A sudden bend in the road caught Nancy by surprise. With a quick turn of the steering wheel, she managed to keep the car in control as she rounded the curve. "Whew," she said, "these roads aren't easy. Especially since I'm not used to driving on the left-hand side." "I keep wanting you to move over to the right, like in the States," George said, "but then, of course, we'd hit another car." Nancy smiled. "Luckily, the roads seem pretty empty, but I'll do my best not to hit another car, George, and to remember to stay on the left. 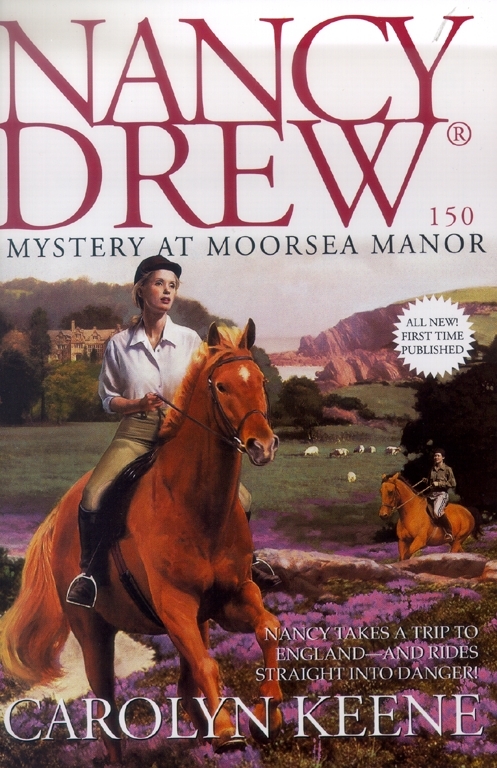 Anyway, the Petersons loved Moorsea Manor," she went on, "and they were desperate to keep it. The thought of her childhood home being sold off to raise taxes practically killed Annabel. So the Petersons came up with this plan -- they used the rest of Annabel's inheritance to turn Moorsea Manor into a money-making luxury inn." "Well, it sounds like they succeeded," George said. "If it's as popular as everyone says, they must be making a fortune on it." "I don't know about that," Nancy said, pursing her lips. "I'm sure most of the money they make gets poured back into the inn. The Petersons raise all those sheep, and they even make their own cheese and process wool right on the farm. They've got stables, vegetable and flower gardens, first-class accommodations, and a fabulous restaurant. It must cost them a fortune to run." "True, but I'm sure they're operating in the black or else they'd have lost Moorsea by now," George reasoned. Nancy nodded in agreement, then added, "But the Petersons aren't running the business just for the money. I've heard they love being innkeepers. In fact, what makes Moorsea so special for visitors isn't just the amazing setting and the luxury. It's the Petersons as hosts." "What's so special about them?" George asked. "They're supposed to be friendly and warm and also incredibly stylish and fun," Nancy told her. "Apparently, the Petersons have this knack for making guests feel as if they're totally special, as if they've all been invited to a private house party." As Nancy spoke, the narrow road, which was now running between two enormous privet hedges that blocked all views, suddenly widened into a fork. Nancy paused and peered at a sign up ahead that was on the right-hand side of the fork. "Hmm," George said, squinting into the sunlight. "That sign says 'A Road, Avoiding the Ramsgate Hill.' But the road to the left is unmarked." Nancy leaned forward. "Not totally," she said, pointing to the left-hand side of the fork. "See that hole in the ground? It looks like there could have been a sign there." "You're right," George said. "I wonder what happened to it." "Me, too," Nancy said, then shrugged. "Well, we probably want the A road as it's the main road -- and we've been on it since leaving the highway from London. The other road might be a B road, which are usually smaller and windier." "I wonder what the Ramsgate Hill is," George said. "Sounds like it must be something major if a sign mentions a way to avoid it." Nancy arched an eyebrow as she stared at George. "That doesn't sound like you, Fayne -- to be scared of a hill." George laughed. "I'm curious to see it, actually. Let's see which road goes by Moorsea Manor." After rummaging in the glove compartment, she took out a colorful brochure and quickly scanned it. "Well, the driveway to Moorsea Manor is definitely off the A road. We're supposed to turn right on it two miles after leaving Lower Tidwell. Obviously we should stay on the A road. But I wonder how much farther it is to Lower Tidwell? The brochure says it's about four hours from London." Nancy glanced at her watch. "We've been on the road four hours. It's one o'clock now. We should be getting there any second." "Hooray!" George said, in a tone of relief. "So what are we waiting for? The A road it is." Nancy pressed the accelerator of the small silver-colored sedan, guiding it onto the right-hand fork. After she took the turn, the road suddenly narrowed. "Weird," she commented, eyeing the high privet hedge that was now inches from her window. "If this is the main road, I'd hate to see what the other road is like." "We'd have been squished, for sure," George said. Twigs from the hedge scraped against her half-opened window, shedding tiny leaves into her lap as the car went by. The road veered sharply left. Nancy swung the steering wheel hard. With its wheels squealing, the car followed the curve. Nancy's eyes widened in disbelief. Before she had a chance to realize what was happening, she was heading up the steepest hill she'd ever driven on. The car appeared to shoot straight into the air, at what seemed to be a ninety-degree angle, although Nancy realized that would be impossible. Are we going to flip over backward? she wondered. The car skidded. Nancy caught her breath, her thoughts racing. If these wheels can't get traction, she realized, the car will slip backward -- all the way down the long, steep hill. Copyright &copy; 1999 by Simon & Schuster Inc.